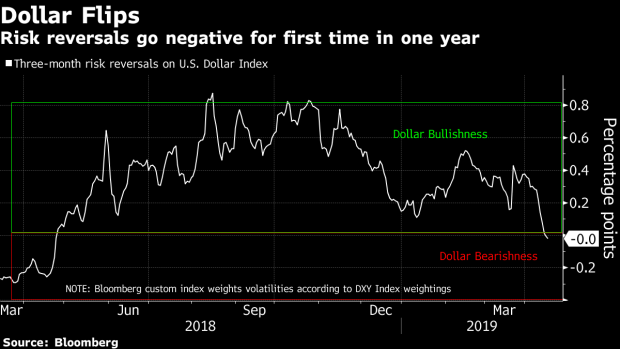 (Bloomberg) -- Hedge funds and money managers have become the most bearish in a year on the dollar’s near-term outlook, according to one of the foreign-exchange market’s most watched gauges of sentiment. In options markets, protection against a falling greenback is getting more expensive. Risk reversals, an indicator of market bias and option positioning, show investors have begun paying more for puts on the dollar than for calls versus the euro, and its other major peers. Not since April 2018 have benchmark puts cost more than calls. While the turnabout stems in part from the Federal Reserve’s recent dovishness, Banque Lombard Odier & Co.’s Vasileios Gkionakis said the shift reflects fresh optimism on the world’s economy and foreign commerce. Even as the International Monetary Fund downgraded its outlook for world growth in 2019 this week to the lowest since the financial crisis a decade ago, hedge funds and strategists are pointing to “green shoots” in the global growth story, and to burgeoning optimism over Chinese government stimulus for the second-biggest economy. The benchmark Shanghai Composite Index of equities is up 30 percent this year. The bearish signal in the currency-options market, derived from the implied volatilities of the world’s major currency pairs, has probably gone too far, according to Damian Sassower, chief strategist for emerging-market fixed income strategy at Bloomberg Intelligence.